A recent thread on Torque Control about Women and the Clarke Awards, got me thinking about my genre reading habits. The thread had its genesis in an interview with 1999 Clarke Award winner, Tricia Sullivan. The first thing that occurred was that I haven’t read anything by Tricia Sullivan, the second that, when I thought about it, I have read very little in the way of recent SF from female writers. So, to deal with the first (and, I suppose, the second! ), I thought I’d give Tricia Sullivan’s writing a go. Considering that it was a Clarke winner, I figured that Dreaming in Smoke would be as good a place to start as any. 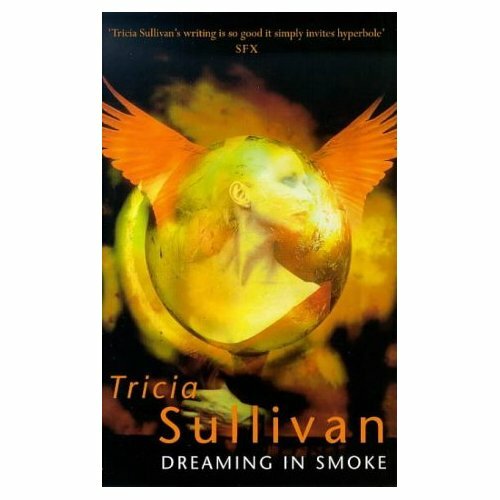 Dreaming in Smoke is a novel of ideas. At its root, it’s a story about an attempt to colonise a hostile alien world. There is also a strong element of cyberpunk to the novel; furthermore, Sullivan has convincingly created a society set up and arranged to cope with the rigours of colonising an unfamiliar planet. Much of this is familiar territory; the colonisation of alien worlds has a long history in SF. Cyberpunk, handled poorly, no longer seems as vital as it did. This novel, however, does have a nice take on it, the “Dreaming” of the title. Most interesting – though this is a little prejudice of mine – is the exploration of the differing social structure which is, again one may argue, not new. Kalypso Deed (one of those born in the colony), a “shotgun” is tasked with entering peoples dreams to ensure that they are able to continue their scientific thinking whilst asleep. Though Cyberpunk itself is as an SF trope a little hoary, this particular conceit is a nice entry into the sub-genre. Sullivan makes a good stab at conveying the dream-states; particularly gratifying is the lack of wonder that Kalypso brings to her work. Mostly bored with her assigned task – especially given that she is tasked with assisting Azamat Marcsson, a competent but dull and unimaginative man. His dreams are so devoid of colour, that she amuses herself by illegally using the resources of their controlling AI (named Ganesh) to listen to old Earth music. The world, T’Nane, had been chosen for colonisation because of its apparent suitability for accepting human life. However, it transpired when they arrived that things had changed and the environment was inimical to human life. This backdrop is crucial to the shaping of the society portrayed. The people selected were selected to ensure the success of the colony. Unfortunately, given that the world they arrived on was not what was expected, when the novel opens, it is clear that the colony is stagnating, if not regressing. The “Mothers” are there as the heads of the society and, though ageing, they still are powerful and if not always respected, they are still listened to. Meanwhile the male “Grunts” (of whom Marcsson is one) were chosen for their suitability for colonising the new world. Unseen (and at the beginning presumed dead) was a group who had been researching ways to adapt themselves and the world to each other. Given their loss to the “Wild” (the lands outside the bases constructed around the ship that took them there) the colony is left unable to grow as the carefully constructed society is unable to adapt to the new situation. It’s clear that they have lost much of the creative brilliance that would be required to solve their problems. Colonisation stories can follow different paths. One solution is that the people arrive on a planet which is similar enough to Earth that there are few problems surviving. Of course, terraforming would be another way. Another, such as in Frederick Pohl’s Man Plus is to alter the colonist to fit them to the environment (this does also remind me somewhat of Ursula Le Guin’s novel The Left Hand of Darkness, given that the inhabitants of Winter were adapted to the peculiar conditions of this planet. Where Pohl’s novel focuses upon the effects of the transformation on the man, Le Guin’s set as it is at a time when the colonisation of Winter is long forgotten is more focused upon the society created). Dreaming in Smoke handles the problem by seeing the planet and the people altered when they come together. Mostly this works; it is consistent with all else that we’ve seen. Given the state of the society which no longer has all that it needs to survive and the unexpected hostility of the planet it seems more likely that the colonists would have to reach a compromise with the planet. The novel isn’t without its flaws. The ambition of the novel does, unfortunately, come at the expense of characterisation. Few of the characters had any great depth to them, and it was difficult to get any real sense of the relationships that they supposedly had. A part of this is probably due to the unfamiliar social structures within a small and clearly delineated population. In this context (and the context of the unexpected dangers found on the world of T’Nane) the coldness between many of the characters is believable. Kalypso is almost an exception to this (although I can’t say that I found her to be particularly sympathetic, though her actions were, in the main, understandable). Also, though the story makes sense and is ultimately satisfying, there were, on occasion, instances where I have to confess that I was a little confused as to how we had got to that particular point. It’s not a huge problem for me, though it may irritate some. I’m inclined to think that the problem is that, in what is a fairly compact novel, there isn’t really enough room for all the ideas. Ultimately, though, being no fan of unnecessary bloat in novels I’m pleased that Tricia Sullivan kept the novel lean. I can’t say whether or not it was a deserving winner of the 1999 Clarke Award; unfortunately I haven’t read any of the other novels on the shortlist. On its own merits, though, it is a novel which, in spite of some minor flaws (and, hey, how many novels are truly perfect?) is worthy. Entertaining, intelligent, thoughtful and featuring prose of a consistently high quality, it was an excellent introduction to Tricia Sullivan’s work. This entry was posted in Review and tagged novel, sf, tricia sullivan, usa. Bookmark the permalink.